Victoria’s Energy Minister Lily D’Ambrosio has announced several renewable energy projects that will share in over $1.1 million worth of new community energy project grants. The funding comes under the state government’s Renewable Communities Program. The aim of the program is to support the state’s transition to a cleaner energy future. The newly returned Victorian Labor government believes this can be accelerated by supporting the development of community energy projects. ‘Community energy’ refers to renewable energy projects initiated, developed and then operated by community groups. This includes solar projects that enable renters, apartment dwellers, and other community members to gain access to solar energy and to benefit from it. The Victorian government says community energy is an important part of the transition to clean energy. As a result, it designed the Renewable Communities Program to provide communities with assistance in creating and developing renewable energy projects. As well as grant funding, this includes access to tools and information to facilitate community energy project development. The government grants were allocated to community energy projects that increase renewable energy uptake, provide a social benefit, reduce costs and also lower carbon emissions. Virtual power plant at Yackandandah – installations of solar energy and battery systems on local community buildings. Community solar farm at Hepburn – a wind and solar energy park. Solar array project in Ballarat – rooftop solar installation at a local charity shop. 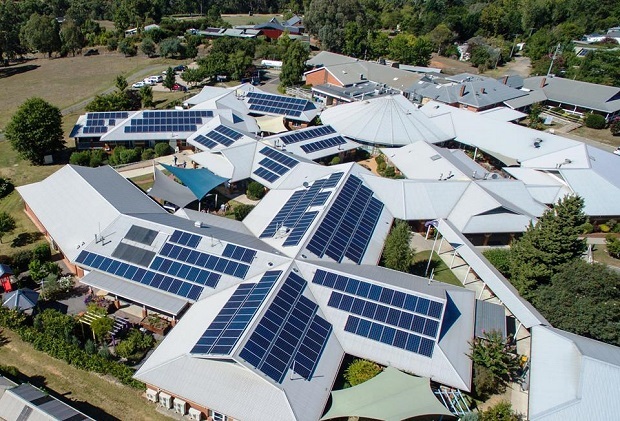 Microgrid installation in Albury–Wodonga – rooftop solar on ten social housing homes. Solar PV in Mirboo North – solar installations on four community buildings. Rooftop solar in Coghill Creek – solar installation on a local community hall. Solar PV system in Stony Creek – to provide solar energy to the local community. The Renewable Communities Program also forms a part of the New Energy Job Fund. The government designed this fund to support Victorian projects that create long-term jobs as well as reduce emissions and drive innovation. The Renewable Communities Program is also part of the government’s push for solar across the state. Under the Victorian Solar Homes program, eligible households can claim a rebate up to $2,225 on the cost of buying and installing a solar PV system. The government has also committed to providing half price solar batteries for 10,000 households. The $40 million energy storage plan is also part of the Solar Homes program.